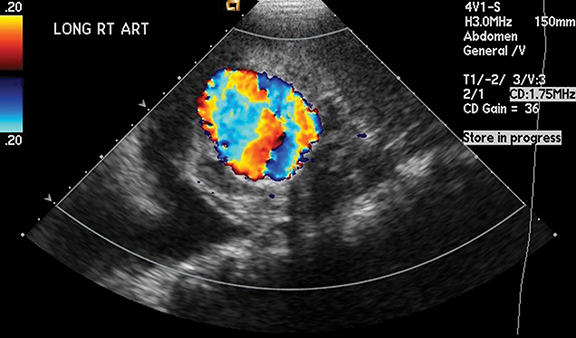 A 10-year-old African-American child with chronic kidney disease, anemia, hypertension, history of stroke, and multiple aneurysms seen on prior imaging, presented with respiratory distress, swelling and cough. Review of systems revealed recent oliguria. An extensive diagnostic workup for the cause of the multiple aneurysms was performed. An infectious or immune-mediated etiology was originally suspected, though testing for HIV, tuberculosis, and fungal infections was negative. P-ANCA, C-ANCA, MPO Ab, Pr3 Ab, and ANA were negative. Complement levels, ferritin, and Von Willebrand antigen were within normal limits. After the aforementioned workup, a genetic cause was felt to be more likely. There was no significant family history on the mother’s side, and the father’s family history was largely unknown. A urine spot mucopolysaccharidosis test was negative. Genetics testing of the following genes was performed, though no pathogenic mutations or clinically significant variants were detected: ACTA2, CBS, COL3A1, FBN1, FBN2, MYH11, SLC2A10, SMAD3, TGFBR1 and TGFBR2. The patient was found to be heterozygous for the c.3651+5_+11del7insG variant of the MYH11 gene, though was of unknown significance. Ultrasonographic evaluation of the kidneys was performed based on the patient’s presenting symptoms and history of multiple aneurysms. Imaging revealed a 4.4 × 2.5 cm partially thrombosed left renal artery aneurysm, as well as an aneurysm of the right renal artery (Figures 1 and 2). 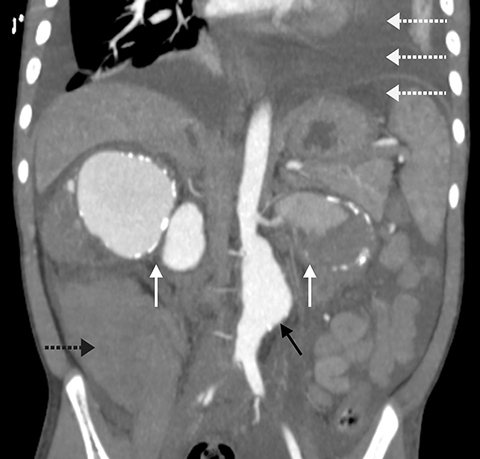 After reviewing the risks and benefits, CT of the abdomen and pelvis with intravenous contrast was performed, which demonstrated aneurysmal dilatation involving the infrarenal abdominal aorta. 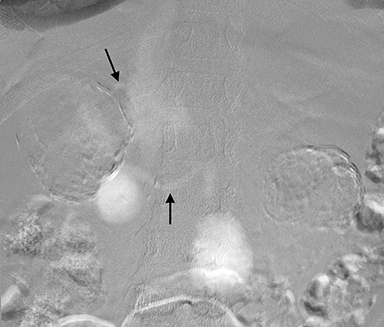 Large partially thrombosed aneurysms with mural calcifications also affected the bilateral main renal arteries, which caused mass effect on the bilateral kidneys. 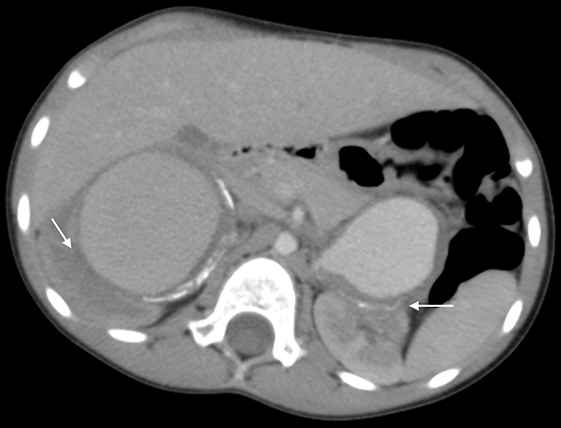 Additional findings included partial visualization of a large hematoma in the right pararenal space, as well as intraperitoneal free fluid, a large pericardial effusion, and bilateral pleural effusions (Figures 3 and 4); three-dimensional reconstructed images were also obtained (Figure 5). 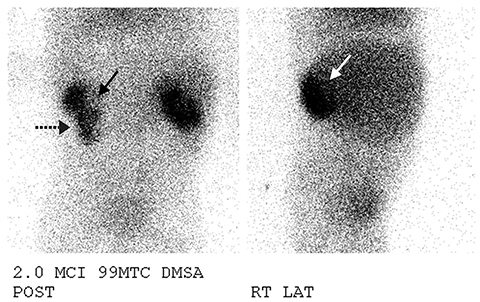 A Tc-99m DMSA nuclear medicine scan revealed a large defect in the superior pole and hilar region of the right kidney. 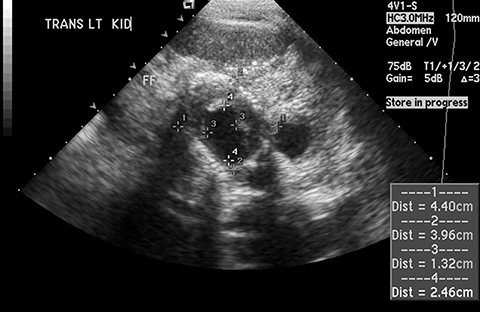 The left kidney demonstrated a large defect in the medial portion of the midpole (Figure 6). The findings are consistent with CT imaging of mass effect from the renal artery aneurysms. Angiography was performed, with CO2 as a safer alternative to iodinated contrast material, via a 4-French Sos 2 catheter. The renal arterial and infrarenal abdominal aortic aneurysms were again identified (Figure 7). The patient was also found to have a right arteriovenous shunt (Figure 8). >Multiple arterial aneurysms in the pediatric population are distinctly rare phenomena. They are likely secondary to an underlying source, such as trauma, infection, vasculitides, vascular dysplasias, and non-inflammatory medial degeneration, among other etiologies.1 Genetic syndromes and collagen vascular diseases are another potential source of multiple aneurysms in children, and include entities such as Marfan syndrome, Ehlers-Danlos syndrome, Loeys-Dietz syndrome, thoracic aortic aneurysm and dissection (TAAD), as well as Turner syndrome, neurofibromatosis, and autosomal dominant polycystic kidney disease (ADPKD).2 The least common of all types is idiopathic, for which all other etiologies are first excluded by clinical and laboratory evaluation. While the aforementioned syndromes may be diagnosed clinically and corroborated with genetic testing, the predilections for specific vascular territories may also help differentiate among them, though significant overlap precludes definitive radiologic delineation. As an example, Turner syndrome and TAAD preferentially affect the thoracic aorta, while ADPKD may involve the thoracic, cervicocephalic, or intracranial vasculature.2 The renal arteries and abdominal aorta may be affected with neurofibromatosis, while aneurysms of both the thoracic and abdominal aortas are associated with Marfan syndrome and Ehlers-Danlos syndrome.2 As such, in this case the differential diagnosis was able to be somewhat revised once patient imaging was obtained. However, the subsequent outcome of the genetic analysis excluded the aneurysmal syndromes as potential causes, resulting an idiopathic etiology for these multiple aneurysms. Treatment for these aneurysms consists of open surgical or endovascular techniques, the latter of which include graft placement and coil embolization.3,4 Use of traditional contrast may be contraindicated during angiography depending on any preexisting kidney damage. However CO2 contrast angiography has begun to play a broader role in these situations, in which the aneurysms are seen as contrast retaining dilatations of the affected vessels. Of note, the aforementioned interventions treat the existing aneurysms though are not considered curative. If surgical intervention is not feasible, studies in animal models and in vitro studies suggest that β-blockers, and antibiotics such as doxycycline or azithromycin, may help limit growth in aneurysms.5,6 However, to date there is no evidence that these therapies definitely prevent expansion. Multiple aneurysms in the pediatric population are unusual phenomena. An idiopathic etiology is very rare, with only a few cases reported in the literature. 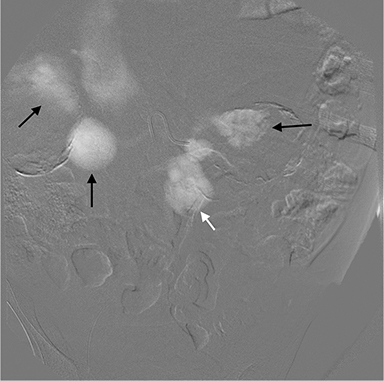 Our case focused on a 10-year-old boy with hypertension, chronic kidney disease, and recent oliguria, who on multiple imaging modalities demonstrated aneurysms of the bilateral renal arteries and infrarenal abdominal aorta. Callicutt C, Rush B, Eubanks T, Abul-Khoudoud OR. Idiopathic renal artery and infrarenal aortic aneurysms in a 6-year-old child: Case report and literature review. J Vasc Surg. 2005;41(5):893-896. Cury M, Zeidan F, Lobato AC. Aortic disease in the young: Genetic aneurysm syndromes, connective tissue disorders, and familial aortic aneurysms and dissections. Int J Vasc Med. 2013;2013:267215. Halpern V, O’Connor J, Murello M, Siegel D, Cohen JR. Multiple idiopathic arterial aneurysms in children: A case report and review of the literature. J Vasc Surg. 1997;25(5):949-956. Checinski P, Henschke J, Pawlak B, Karwowski A, Samolewska E. Multiple aneurysms in childhood – Case report and review of the literature. Eur J Vasc Endovasc Surg. 2000;20(1):108-110. English WP, Edwards MS, Pearce JD, et al. Multiple aneurysms in childhood. J Vasc Surg. 2004;39(1):254-259. Mosorin M, Juvonen J, Biancari F, et al. Use of doxycycline to decrease the growth rate of abdominal aortic aneurysms: a randomized, double-blind, placebo-controlled pilot study. J Vasc Surg. 2001 Oct;34(4):606-610. Patel A, Arndt S, Nguyen J, Ezell B. 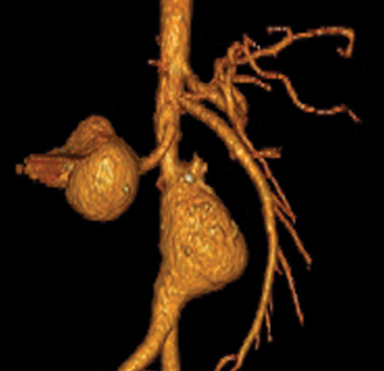 Multiple idiopathic aneurysms in a 10-year-old child. Appl Radiol. 2016;12(45):24-27. Prepared by Dr. Patel while a Radiology Resident, Mr. Arndt while a Medical Student, Dr. Nguyen while an Assistant Professor, and Dr. Ezell while an Assistant Professor in the Department of Radiology at Tulane University School of Medicine, New Orleans, LA.